Basically, a labelling machine is used to stick labels automatically on products, containers, bottles etc. Manually labelling can be time consuming and unprofessional way of packing a product. A long time ago, when the labelling machines were not invented, the labelling was done manually on bottles, jars, containers etc., which was a lengthy as well as time consuming process. But now, labelling machines have become a blessing for the industries. When it comes to bulk packaging of products, there is no other way of labelling the products except using a labelling machine. So, labelling machine is used in packaging process of many industries like pharmaceuticals, cosmetics, FMCG, food and beverages etc. As there are many different types of products manufactured in various industries, it becomes obvious that the labelling machines especially self adhesive sticker labeling machine and sticker labeling machine also vary with different features. The container types and sizes are different and thus different labelling machines are used for them. For different industrial applications, shapes and sizes of the containers and vessels, various types of labelling machines are used. The labelling machines are differentiated on the basis of automization and semi-automization as well as type of labels and positioning of the labels. 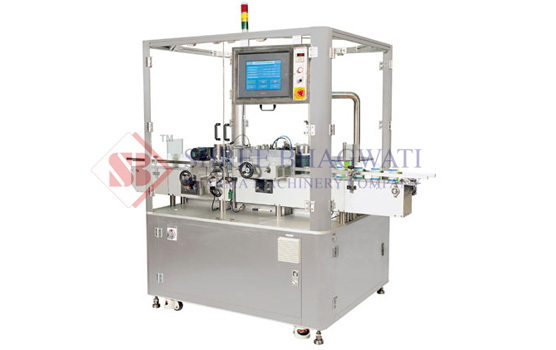 Some of the types of labelling machines include rotary labelling machines, wet glue labelling machine, sticker labelling machines, self adhesive labelling machines which are widely used in different industries. How To Select a Labelling Machine? Basically, there are two types of labelling machines, semi-automatic labelling machines and automatic labelling machines. The semi-automatic labelling machine is suitable for small scale industries and appropriate for labelling round containers, round bottles and other uneven shaped containers. The automatic labelling machine is much better than semi-automatic labelling machine because of its automatic features. The automatic labelling machine is better for pharmaceutical industries as it avoids human contamination and keeps it free from germs for a long period of time. These labelling machines are further classified into sticker labelling machine, self adhesive labelling machine, wet glue labelling machine etc. All these machines are either equipped with automatic features or semi-automatic features. Select the labelling machine which suits the shape and type of the container. Ensure, that the features of the labelling machine are as per your production requirements. The cost of the labelling machine should be as per your budget. Check the power consumption of the labelling machine. Also need to make sure that the labelling machine is efficient and quick enough to achieve your production targets. The labelling machine you select should be durable and incurring low maintenance cost. The labelling machines help in improving production rate due to its technological advancement which obviously results in saving time and money both. The labelling machine also helps reducing wastage. Moreover, less manpower is utilized if a labelling machine is purchased for your industry. There are many companies which provide labelling machines, but you need to select the company manufacturing quality labelling machines with features suiting to your requirements.